A tripel that is very much in the style trgat I like them. Color is on the lighter side, yellow tinged with orange. Nice bubbly, fluffy foam with lots of prickly carbonation. Aromas of Belgian yeast and spice dominate, with some white grape. Flavors of candi sugar, spice, bubblegum and banana, some grape and a little green apple/pear. 3 yrs old, puffy head that stays frothy with good lacing, unique with an addictive aroma of sweetness reminiscent of bubblegum, pleasant taste of musty fruit and fermenting apples followed by caramel, sweet malt follows spices such as clove and coriander with a silky mouthfeel. Bottle. Huge white head. Clear golden color. Bananas, cloves, Belgian yeast, candied sugars, bready malts. Some abv showing. Dry and carbonated. Cerveza de color dorado con una pequeña cabeza blanca. De cuerpo medio y alta carbonatación. Del aroma se perciben hierbas, miel, levadura y pimienta. En boca destaca el cilantro, las hierbas y la naranja. Herbácea y dulce. Una muy buena opción. 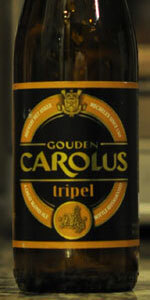 Brouwerij Het Anker Gouden Carolus Tripel, 9% ABV. Pours pale golden, with lots of white foamy head that left lots of foamy lacing - almost like Orval. Nose is yeast and sweet fruit. I slurped some of the head and it was quite bitter, but the beer itself is only slightly bitter, but yeasty, and a bit fruity. Excellent mouthfeel, overall excellent. The back of the bottle says: "PRODUCE OF BELGIUM Lotn° 17036 15:57"
Appearance: The body is hazy and has a light gold appearance with hints of darker beige. The white head is huge with a fluffy consistency. It has very good lacing. Aroma: It has a lovely aromatic quality laced with notes of clove and just a bit of bubblegum. There is a light coriander scent that starts to come through as the beer sits longer. It is a very lovely beer to smell. Retronasal scent gives off just a bit of skunk. It isn't strong enough to make too much of a difference but even in brown bottles it feels like import hasn't been too kind to this beer. Taste: Up front there is a sweet coriander flavor which is nice and adds to the mix of earthy, herbal, hop flavors. It has just a bit of a sweet candy and light malt finish which mingles nicely with that slight herbal character. The aftertaste is just a bit of cotton candy. Mouthfeel: It feels light and effervescent with just a hint of bitterness to cut the levity. The mouthfeel is such that it supports the beer in the background like a frame on a painting rather than detracting or adding to it. It feels perfect. Overall: As previously mentioned there was just a light bit of skunkiness to the beer which entered the nose after drinking for a bit. As an import I would still recommend the beer because it smells and tastes great and the impact from that slight skunk isn't so much that a person would have their experience ruined by it. If you are able to buy this some place in Europe then I would highly recommend giving it a shot. If you are buying it as an import from the U.S. I would, again, recommend picking up a bottle so that you can enjoy this beer. Every part of the construction of this beer feels deliberate to give the drinker an enjoyable experience.